Episode 42 of Radio Free Charleston is online now! This one’s called “Aqua Teen Hunger Force Shirt” and features music from Barrelhouse Bonnie, Doctor Senator, and The Synergy Collective. We also have a brief visit from WCW’s Daffney, and for some reason, I channel the energy of Bill O’Reilly in rant mode. This is another of our genre-hopping shows, with honky-tonk piano from Bonni, straight ahead rock from Doctor Senator, and music with a message (and dance) from The Synergy Collective. You can catch The Synergy Collective this Saturday night, from 8:30 PM to 10:30 PM at Capitol Roasters Cafe. An added treat on RFC this time around is “Iron Man 1930,” vintage animation with a new soundtrack. We shot our host segments last Friday at the Lee Street Triangle. It was raining and miserable, but it photographed well. This is yet another show where I didn’t write a script, so it’s all ad-libbed. We did it all in one take, too, so the entire shoot took about ten minutes. 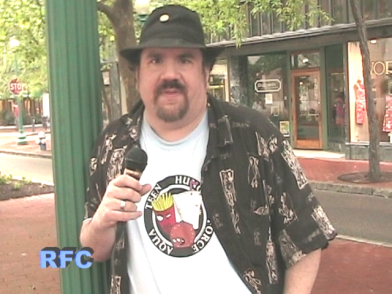 I’m wearing the Aqua Teen Hunger Force shirt, since it’s one of my favorite shows, and even if they don’t mention it on the air, it still might drive the hit count up. Barrelhouse Bonni is a local writer, singer, piano player and Blues Manager. Actually, I think she splits her time between Charleston and Chicago, but we were lucky enough to catch her at the Unitarian Universalist Church last February 29, as part of their night of blues and soul music. That’s also where we recorded Doris Fields from episode 37 (we’ll have another tune from Doris very soon on RFC). If you were watching carefully, you saw Bonni singing backup on Lady D’s song, “Higher.” We held the song, “Memphis In May” until now, because, well, it’s May now, isn’t it? Bonni is joined on this song by Ko, the mysterious master harmonicist. Last March, RFC Big Shot Melanie Larch and I made the trek to Logan to see Jerry Lawler wrestle Mad Man Pondo for All Star Wrestling. Also on the card that night was “The Queen Of Scream” Daffney, famous from her days in WCW. Daffney is a real sweetheart and agreed to do an animation intro for the show. You can buy a shirt with her “Anime” design here, which would be a nice thing to do for her, since she did the intro for us. If you’ve been reading PopCult lately, you may have already seen Doctor Senator’s song, “Awkward Social Situation.” I posted a YouTube clip of it last week as a teaser for this episode, and also because the song was so good that I didn’t want to hold it any longer. 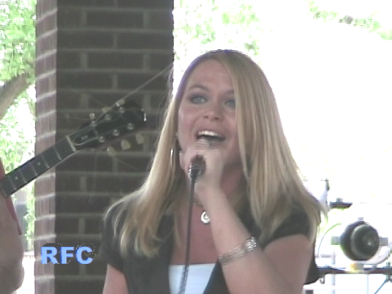 We recorded this May 3 at the “Rock In Love” tour sponsored by The Bridge. It was a great day, and it was fun to capture one of Charleston’s most original bands again. Doctor Senator was previously on episodes 27 and 31 of RFC. Another of Charleston’s most original bands is The Synergy Collective. 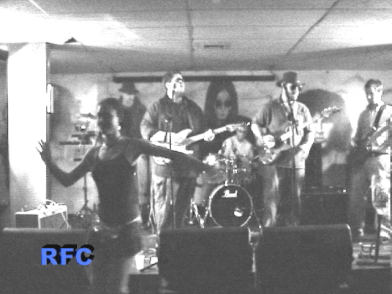 We recorded them at the benefit for Emily Gunter-Haynes at the Blue Parrot back in early March. This was the first time they’d performed the song “Awry,” and it was also one of the few times I’ve seen the guys playing electric guitars. You can see and hear this exciting band Saturday night at Capitol Roasters Cafe. Mel and I plan to be there, and it’ll be a fun night of great music. 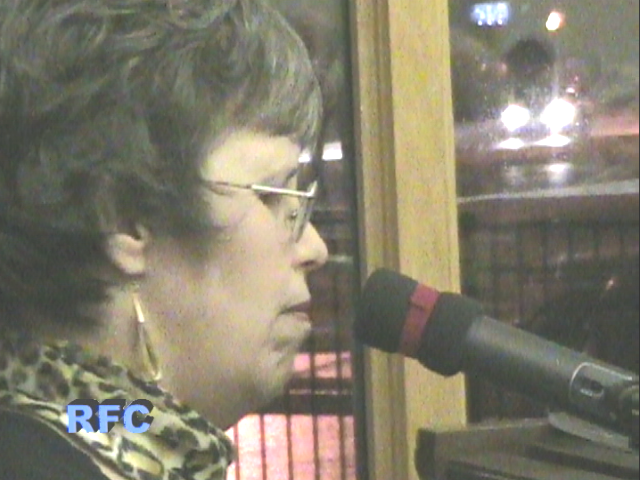 TSC were previously on episodes 33 and 36 of RFC. 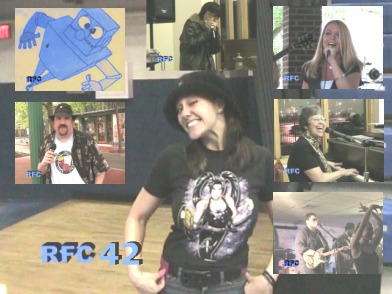 That’s it for episode 42 of RFC. There are some “Easter Eggs” and other surprise gags in the show, but if I told you about them, they wouldn’t be surprises, so now you get to experience THE FUN OF DISCOVERY! 42 rocked! Cant wait for 43! Awesome Rudy! Let’s watch the potty mouth, though. M’kay? Hehehehehehe, Bill! Love seeing Syngery Collective again! This is definitely a solid show all-round, especially in terms of the music. Any chance of a solo Ko shot on a future episode? I remember “the Queen of Scream” from the waning days of WCW, so it was fun to see her doing an animation intro. Your camera crew must’ve had nerves of steel when watching you channel Bill O’Reilly. I’m finally getting caught up on these shows. You really need to promote these better. First of all, you got me in trouble with the missus–that chick introducing the animation is too cute to be believed. Then you have a hot dancer in one of the other videos and a really hot singer in another. Lotta chicks in this show–which is good if your sig/other is not watching over your shoulder. Nice to see some ATHF love on RFC, too. Music goes so well with lust.